What is AeroFS API Access and how do I enable it? 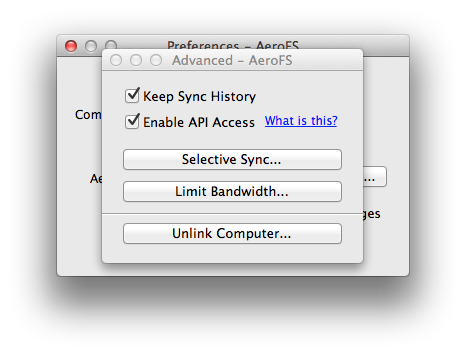 The AeroFS API is used to download and upload content stored on your devices running AeroFS. The API pulls files from either a team server or devices linked to your AeroFS user ID. It does not pull files from other users' devices, even if they have the files that you are trying to access via the web client or mobile device. With the AeroFS API access enabled, you can log into your AeroFS Web Admin Panel and click on the My Files link or simply open your mobile app to access your files. Developers can read more on the AeroFS developers portal. API Access is enabled by default, and can be changed at any time on the AeroFS Desktop Client by going into Preferences> Advanced and checking or unchecking the Enable API Access checkbox, as seen in the screenshot below. Enable to grant applications you've authorized access to the files on this computer. In other words, to enable API access, useconfig api enable, and to disable API access useconfig api disable. How Do I Completely Uninstall The AeroFS Desktop Client From My Computer? How Do I Resolve The "All Your AeroFS Clients Are Offline" Message On The Web/Mobile Client?